The new year rang cold and blistery, but exciting with the promise of a spicy Alfredo Hernandez clinic. Alfredo flew in to temps in the mid-twenties, and tried his best to stay positive about it. He was entertaining as always, but I only audited for 4 hours. I was hoping to ride, but due to Savy’s injury (a bone deep gash on her leg that amazingly didn’t cut anything important) I didn’t feel prepared, so Nicole rode her. The worked on flying changes, and specifically an exercise to help with being late behind. 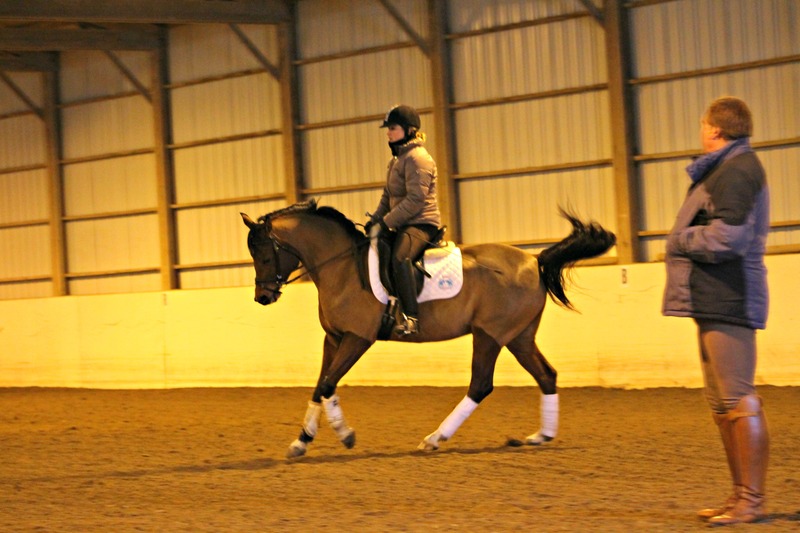 He had Nicole ride on a 15 meter circle, alternating between haunches in and haunches out at the trot. 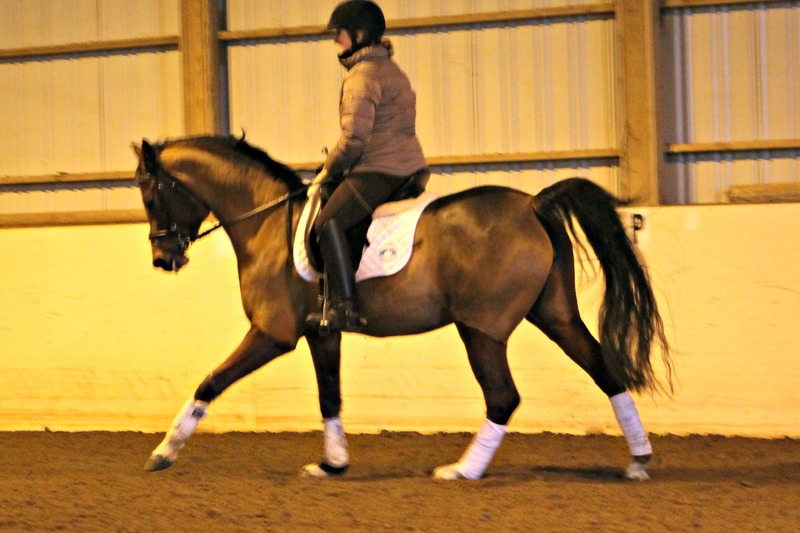 Once she mastered that (which took about 5 minutes), he had her do it at the canter, changing leads with the haunches. It forced her changes to be clean. 10 minutes later she figured that out. After that they worked on the piaffe with the bamboo, which she also figured out immediately, he stopped and called it a day. He said there was no point to push it, since she did what he was trying to get her to do. Did I mention Savy is incredibly smart and athletic? That doesn’t mean she’s easy – many of her “clean” changes included a gigantic buck in the middle, but hey. She’s 5 doing changes. Give her a break. I mentioned the attitude to Alfredo and he said it’s what makes her good. So I’m making peace with bucking during every ride. It’s just who she is. No petting during work. The reward is walking. So if they do something right, walk and reward. 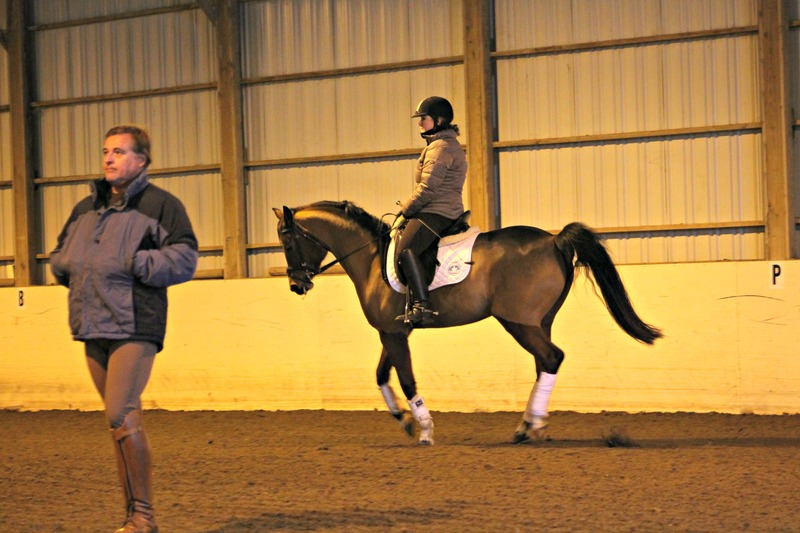 If the horse is late behind in the change, ask with the haunches first instead of the shoulder. Yes, this is not technically proper. But it’s a learning exercise for the horse, not the way you’d ride in the test. Make the horse flexible before straight. Alfredo was a fan of working constantly on a 15 meter circle. 15 meters because he didn’t want the horse to touch the arena wall. This forced the horse and rider to stay on the outside rein. For the last month, all of my lesson have been entirely on a 15 meter circle. It appears Nicole is using a new tactic to get me to bend; muscle memory. She’s completely by passing my mind and drilling the feeling into my muscles. It’s actually working. Luckily Alfredo is coming back in June and July, and hopefully I’ll be riding in those clinics. Things are coming along well (mostly) in our training. 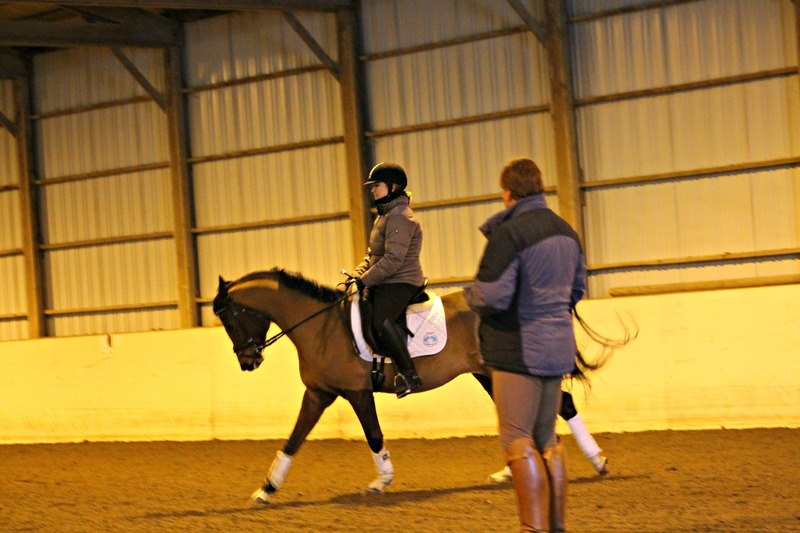 We’ve been working hard on improving my riding the canter. Does that make sense? Savy has a nice canter, I have to learn how to ride it. I’m learning what doesn’t work (pinching thighs), but I’m still figuring out using leg without pinching. I get a nice canter for a few strides, and then I lose it and Savy breaks. This is how the whole dressage thing works, nice moments built on nice moments until one day it’s all nice and you can move on to perfecting something else. The all nice phase lasts about one week. This entry was posted in Clinics, Personal Musings, Training Updates and tagged Alfredo Hernandez, Arabian Mare, Clinics, Dressage clinics, Flying changes, Harrington Dressage, Perfectionist. Bookmark the permalink.